Light stops penetrating water at 10 degrees. I find getting low to the water (below the 10-degree angle from the angler’s eyes to the fly or indicator) greatly reduces the glare that impedes a fly-fisher’s vision. Natural light conditions can influence the angler just as much as they can influence the fish. Yes, we have the aid of polarized eyewear that allows us to see the flies and rigging we are using as well as the trout we are targeting. Nonetheless, there are those times when our eyes fail us, even with the help of $250 sunglasses. The sun is too bright, the light is too flat, or it’s just too dark. There are certain tricks fly fishers deploy to deal with these situations. Guides in particular have commonsense tools to make it a bit easier for their guests to see what is going on. One of the simplest is to position the angler in a way that the glare of natural light is significantly limited. This could be downstream of the targeted holding water, or perhaps along the flank of the holding water and in a way that the directional flow of natural light is at the back of the person casting. Sometimes, however, gaining such a position is not possible. The water may be too deep or the casting lane obstructed. This is where getting low to the water can assist a fly fisher in seeing the rigging. When I am guiding a guest and glare or flat light is just too much, I will drop to a knee, with the surface current flowing at diaphragm level to better gauge the drift of the rigging. Remember that light stops penetrating the surface at 10 degrees. When I get at a low angle in order to see my rigging, my vision is typically below this 10-degree threshold. 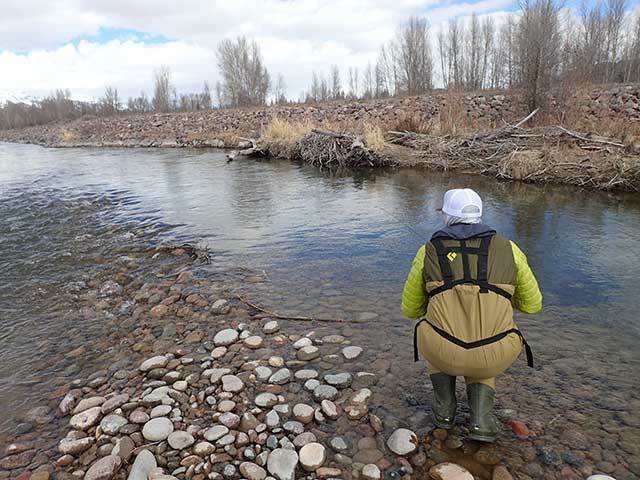 Sunlight: Sunny, mostly sunny and partly cloudy conditions All holding-water types on streams and stillwater, favoring deeper lies when surface activity is negligible. Dry Flies and Nymph Patterns: Stonefly, caddis, dragonfly, damselfly, terrestrials and some mayfly imitations. Colors on the red side of the color spectrum: red, orange, yellow. Streamers: Baitfish imitations in bright hues: yellow, gold, copper, chartreuse, etc. Retrieve with speed and erratic movement. Cloud Cover: Overcast, cloudy, and mostly cloudy conditions All holding-water types on streams and stillwater. Water column near the surface can show increasing signs of activity. Target slower, shallower portions of a stream or lake that are a good distance from typical lies that are deeper and have swifter currents. Dry Flies and Nymph Patterns: Stonefly, chironomid, dragonfly, damselfly, and terrestrials imitations, but trending toward mayfly and caddis imitations. Colors on the red side of the spectrum but trending toward colors on the violet side of the spectrum: blue and purple, as well as naturally dark colors. Streamers: Baitfish imitations in bright hues, but trending toward darker hues on the violet side of the color spectrum. Dawn and Twilight All holding water types on streams and stillwater. Potential for decent activity at or near the surface in riffles, seams, eddies, confluence points, and flats on streams. Drop-offs, flats, bank edges, submerged vegetation, and tributary outlets on stillwater. Dry Flies and Nymph Patterns: Caddis and mayfly imitations primarily. Some activity on stonefly, chironomid, dragonfly, damselfly and terrestrial imitations. Colors on the violet side of the spectrum: blue and purple, but also black. Streamers: Baitfish imitations with darker hues on the violet side of the color spectrum: blue, purple, dark gray, but also black. Pre-Dawn and Post-Twilight All holding-water types on streams and stillwater. Potential for decent activity at or near the surface in riffles, streams, eddies, confluence points, and flats on streams; drop-offs, flats, bank edges, submerged vegetation and tributary outlets on stillwater. Dry Flies and Nymph Patterns: Large patterns imitating stonefly, caddis, dragonfly, damselfly, terrestrials, and mayfly. Colors on the violet side of the spectrum: blue and purple, but also black. Nothing does more to assist the fly fisher in seeing his or her rigging than the composition of the rigging itself. Wing material on a dry fly is a perfect example. Most wings are composed of lightly colored material to assist anglers in detecting their fly. Common materials include calf tail, EP Fibers, and Poly Yarn. White is the most common color, with pink, yellow, chartreuse, and red also popular. But there are times when the glare of the sun or flat light on a riffle renders these colors ineffective. This is where darker colors can come to the rescue. The use of black calf tail on a Parachute Adams, referred to as a “Glarachute Adams,” is a remedy for cutting through glare that might have been around since before I started guiding in the early 1990s. The basic concept is that dark colors like black can cut through glare in a way that lighter colors cannot. For some patterns, going with a darker wing can be more imitative than a lighter-colored wing. This is the case with mahogany dun and brown drake imitations and, to a lesser degree, Callibaetis and March brown patterns. The idea of the Glarachute is not reserved for surface patterns alone. It has a role in nymph fishing as well. In the Rocky Mountain West where I guide, nymphing is done primarily with a floating or near floating indicator. These devices assist in detecting strikes and suspending nymph rigs. Indicators come in many forms. Some are plastic balls called Thingamabobbers, some are yarn puffballs, and some are composed of colored leader material referred to as sighters. Generally these indicators are brightly colored in red, pink, orange, yellow, or white. But just like light-colored wing material on dry flies, these colors can become lost in glare. 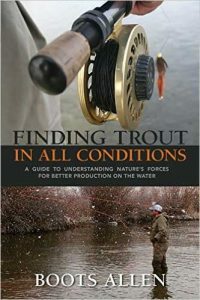 To compensate, many fly fishers over the past several years have turned to darker, sometimes asphalt black, indicators. Just like the Glarachute, these darker indicators cut through sunshine and flat light glare better than the more traditional colors. My favorite indicator is a black Thingamabobber between ¼ inch and 1¼ inch in diameter, depending on the situation. I actually use a black Thingamabbber in every natural light condition when I am nymphing with a suspension device.